You are here: Home » Augmented reality colouring books. Wow! – is all I can say. I thought this would be a great activity for 4 olds but this 64 year old has spent the morning colouring in pictures. 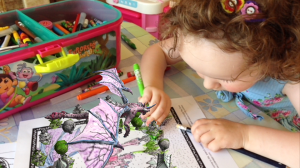 ColAR Mix is an augmented reality app that turns paper drawings into animated 3D objects. Available for Android and iOS tablets. Basically you choose a picture from the website, print it off and colour it in. The rest is ….magic! Hurry up and try it out because it’s free till the end of the month but then you have to pay. I think the model is that the app will be free but you will have to pay for the picture downloads – all the more reason to play with it NOW. What a great fun activity for the end of term.